First published on PCs by Spanish studio Diabolical Mind, COWCAT games brings for Xbox One Riddled Corpses EX, a remaster of this fast-paced twin stick shooter in fluid 60 FPS in which you will fight hordes of enemies and giant bosses while aiming for the top of the leaderboard. A game that exhales nostalgia with its 8 bits/16 bits graphic style and offers a gameplay that’s challenging, addictive and is always asking for one more run. If possible, bring a friend with you, take as much ammo as you can and follow us into this review for Apocalypse on earth! 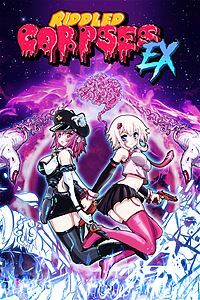 Riddled Corpses EX is pure fun to play thanks to some addictive gameplay. Be it playing solo or with a friend in local coop, it has responsive commands and challenging gameplay. Seriously. I had a hard time to stop playing it. I simply love games that keep challenging me for some more! The game presents three distinct modes: In Story mode, with cut scenes and a simple story, you can use the gold you pick up during stages to level up your character or unlock new weapons and characters. And whenever you hit the Game Over screen, you can restart the game from the stage you wish. In Arcade mode, a much more difficult one, you start from zero and must reach the final stage in one go. This is going to be a tough ride, I promise you. Only the most persevering will be able to beat it. And finally, in Survival mode, you will fight endless waves of enemies to see how long you can survive. If you thought Arcade was though, you better think again. This is not for the faint of heart, this I promise you! You have a good number of different enemies in your adventure. Some are tougher than others, requiring a lot more bullets to be laid down, while others are much faster and ready to run straight forward to you in an attempt for a suicidal attack. The first levels will be no big deal, but prepare to fight dozens of enemies of different types at the same time in later levels. Your screen will be filled by monsters in no time! The game has 6 characters with different abilities: Jon, your first hero, is a police officer with high damage and low mobility. Cloe, his sidekick, has high mobility and dos little damage compared to Jon. Cloe has the ability to attract gold. Fael, a character with powerful guns that starts with two times your normal amount of lives. Nora, a cop from the future, with the ability to carry two turrets. Liery, a special guest from the mobile game Candy Cut Halloween, has the useful ability to duplicate the gold you pick (also very useful for grinding). And finally Erika, another special guest, this time from mobile game Devil’s Cauldron. The game has three arranges of music, the original and a special one created for this remaster. The third one, my favorite, only becomes available when you finish the story mode. And it’s worth all the work, trust me. The sounds and music also play an homage to the 8 bits/16 bits era and are a delight for the enthusiast of that era of gaming. Visuals of the game are in beautiful and colorful pixelized graphics inspired in the 8 bits/16 bits era, but with a more complex color palette. Menus also presents beautiful anime inspired images of the characters. With a total of 6 characters, I could imagine this game being played with three other friends for maximum fun. But I’m satisfied to be able to play it in 2 players coop. The story of the game, the bound between your characters, is rather weak. I understand that, in the end of the world, all help you can find to kill bad guys is more than welcome. But I see it as an opportunity to give more soul to the game, an opportunity that hasn’t been fully explored in Riddled Corpses EX. The sound emitted by some enemies in the last levels, some sort of screech, irritated my sister’s ears. I had no problems at all with it, but if you have some injury or sensibility in your ears, it may end up bothering you. Riddle Corpses EX [Score: 82%] A challenging and addicting game that will require sharp reflexes and a lot of perseverance to be overcome. Playing solo or in local coop, it leaves that taste of “just one more round” that keeps you engaged with the game after every challenge. I hardly say that for a game, but It’s a must buy for everyone who loves good twin stick shooter.